Because of this weeks long-awaited release of the latest Star Wars movie, the challenge was to build a Star Wars interaction. This challenge was a lot of fun because of its many possibilities. 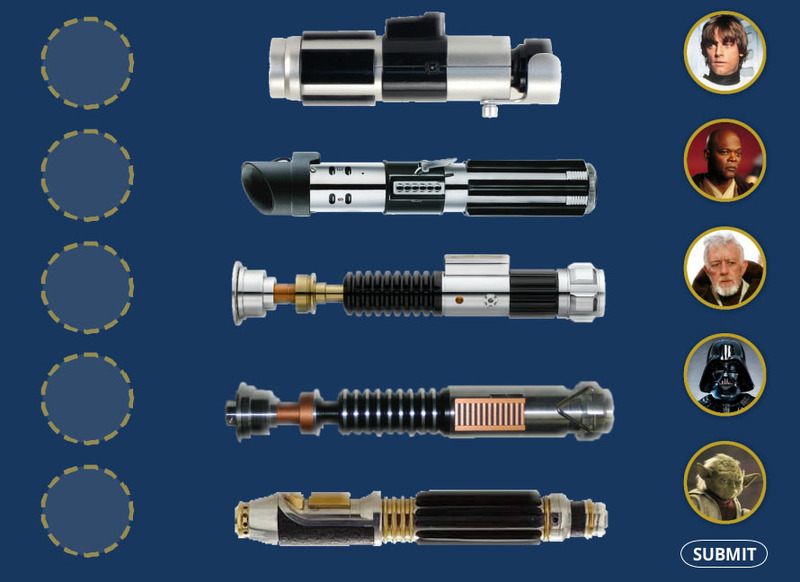 I had a few thoughts on what type of project I would build, but after looking at a infographic of Star Wars light sabers, I realized how little I knew about the subject. Not only was I unaware of each character’s weapon, (I didn’t even realize that they were all different), I couldn’t even remember what colour their lightsabers were. I made a drag and drop interaction, matching the character to their weapon. The fun parts were figuring out the best way to make the lightsabers turn on when a correct selection was made, and adding the sound effects. When I posted my entry, a feedback comment that I got was that the player wanted a reset button so that she could fix her incorrect guesses. I explained that a reset button was unnecessary because the pieces could be moved after a wrong guess. To avoid confusion, I decided to add some text stating that the learner could continue to play, after making a wrong choice. As a early Christmas present, I’m including the working file, that way you can see how it was made. You can download the working file here and you can see the interaction here. Happy Holidays everyone!